Watches previously owned by celebrities have been on a bit of a hot streak as of late. In the last year, Paul Newman’s Rolex Daytona, Jackie O’s Cartier Tank, and other famed timekeepers have all surpassed auction records, and it seems the theme is set to continue for 2018. This past week, Phillips Auctions announced one of Elvis Presley’s numerous fine timepieces is now slated for the auction block. On May 12th and 13th during the Geneva Watch Auction:SEVEN, this unique Omega dress watch will be sold to one lucky bidder. Elvis Presley’s Omega Watch is going to hit the auction block. The big question here, before getting into the specifics of the watch itself, is simple. What’s it worth? Sure, Paul Newman’s Paul Newman pulled in north of $17M, and Jackie O’s Cartier tank cleared over $375k, but what about the King of Rock ‘n Roll? Phillips is putting an estimate on the piece between 50 and 100k CHF (basically just north of $100k USD on the high end), but there’s some debate to be had here. The PN went down as the most desirable Rolex Daytona of all time, and the buyer of Jackie’s Tank was none other than Kim Kardashian. By comparison, a JLC owned by Bob Hope—at a watch level, at least on the same level—barely cracked the $30,000 mark this past year. Sure, we know that Elvis has more fans out there than Bob Hope, but it still begs the question. Further to this, Antiquorum sold another Omega of Elvis’ previously, once in 2012 for over $50,000, and then again in 2014 for less than $40,000. Further down the rabbit hole you go, the more other obscure Elvis watches you find having crossed the auction block with estimates in the $6-8K and $10-20k range, so if we take the current celeb trend out of the equation, it’s hard to see this piece hitting its high estimate. That said, here are a number of details that give this Elvis Omega a touch more cachet. 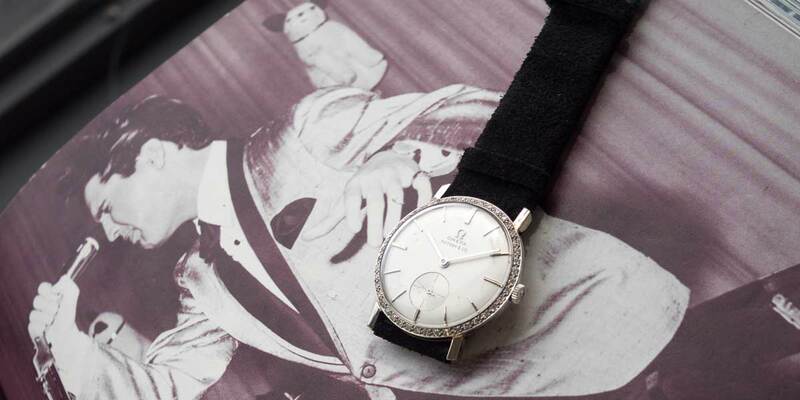 Elvis Presley’s Omega Watch is estimated to go between CHF 53,000 to CHF 107,000. From a distance, the Omega on offer doesn’t seem like much, though it actually has a lot going for it before even getting to its celebrity pedigree. Cased in 18 carat white gold, the slender silver-dialed dress watch is set with 44 round cut brilliant diamonds on its bezel, which is almost surprising considering Elvis Presley’s more “flashy” years did not come until later in his career. Its silvered dial features applied batton indices, as was the most common configuration of Omega pieces of the era. The piece is powered by the brand’s hand-wound calibre 510, which is stamped OTX, designating the piece as having been meant for US export. By now you’ve likely noticed a much-desired inscription adorning its dial. 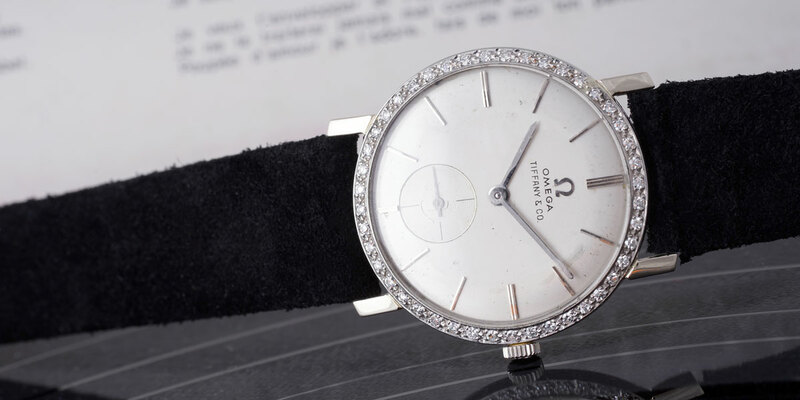 As with a good number of desirable and highly collectible vintage timepieces, Elvis’ Omega was retailed by Tiffany & Co., and bears the company’s name on its dial just below the logo and standard inscription of Omega. 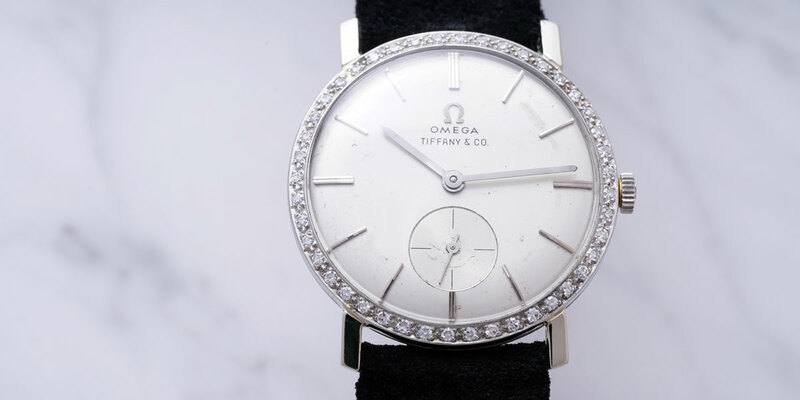 What’s interesting with Tiffany dials—as we discussed in greater length in this feature on vintage Tiffany dial Rolex watches—is that (at least in the case of Rolex) some dials were stamped by Tiffany & Co. themselves, whereas others were complete before the watches left the manufacture in Switzerland. In the case of Omega, it is unclear where this stamping took place, however overall authenticity is anything but a concern. The piece is well-documented through its history, and will be sold with a certificate of authenticity from the Elvis Presley Museum, as well as a book on Elvis that featured images of him wearing the watch in question. The story behind Elvis coming to own the watch, as well as its transition into the hands of the present owner is an interesting one. On Christmas day of 1960, the king of rock and roll reached a significant benchmark in his career by selling 75 million records worldwide. Considering his hiatus from recording between 1958 and 1960, as Elvis served time in the U.S. Army, hitting this stratospheric number was no small feat to say the least. Exactly two months later, On February 25th 1961, RCA Victor held a charity event and concert, as it was now time to return the legendary performer to his position of glory at centerstage. Playing to a significant crowd including none other than the Governor of Tennessee—who during the evening made a proclamation that the day would then be known as Elvis Presley Day—the king’s benchmark achievement was properly commemorated part way through the event. 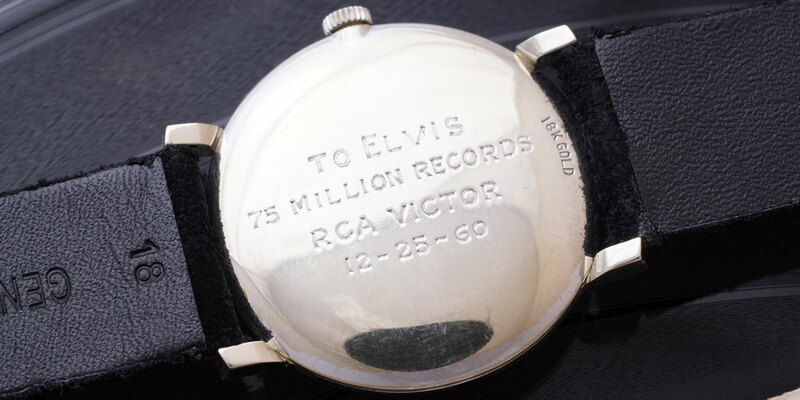 Not only was Elvis presented with the watch seen here, bearing the inscription “To Elvis, 75 Million Records, RCA Victor, 12-25-60”, but also a plaque with a similar inscription which remains in Graceland to this day. Those who’ve traced the origin stories of other Elvis watches in the past will recall that the man was occasionally known for giving away some of his watches. Back in 1990, a watch gifted by Elvis to Redd Foxx was sold in an IRS auction for a modest $17,500, which went to paying off a part of the comedian’s back taxes. In the case of the piece seen here, the story according to Phillips is an interesting one. So the story goes, the uncle of the current owner crossed paths with the king, and commented on how much he liked the Omega that Elvis happened to be wearing. Seeing the diamond-set Hamilton his fan was wearing, it is said that Elvis proposed they trade, and the rest was history. What are your thoughts on Elvis Presley’s Omega Watch? Comment below.